These will not be imported into the USA anymore. New Sights made by IWI/Meprolight (not refurbished). 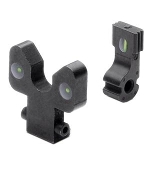 Will fit AR, ARM, Golani, SA R/LM series rifles that have night sight hardware on them already. Includes 12 pages of IWI Galil Installation Instructions straight from the aromres manual. Price is for one pair of front & rear sights only.